Your empire of computer workstations has grown to near unmanageable proportions, and it's been a long time since you were able to keep track of everything all at once. In order to recover your status as Omniscient Network Administrator God, it's time you brought in the big guns -- it's time to get a copy of MyLanViewer. 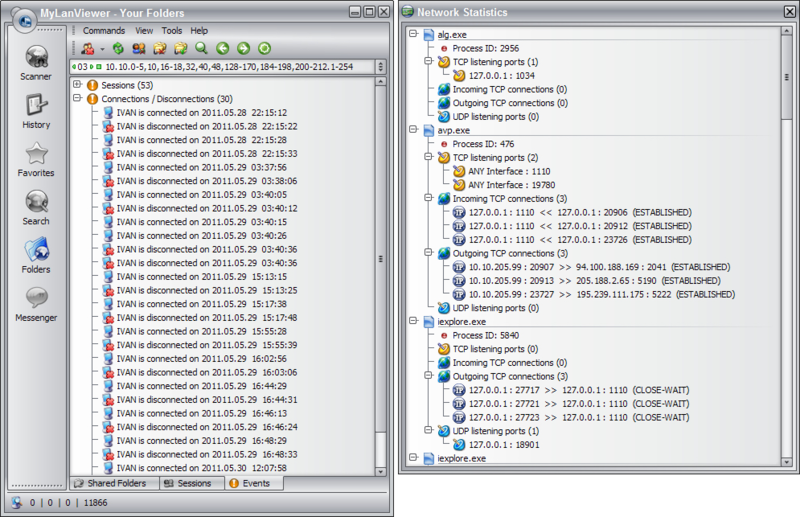 MyLanViewer is everything you need to manage your LAN in one handy package. Run Whois and Traceroute, schedule remote shutdowns and administer Wake-on-LAN functionality. Hurl messages across your LAN to all of your users with ease. 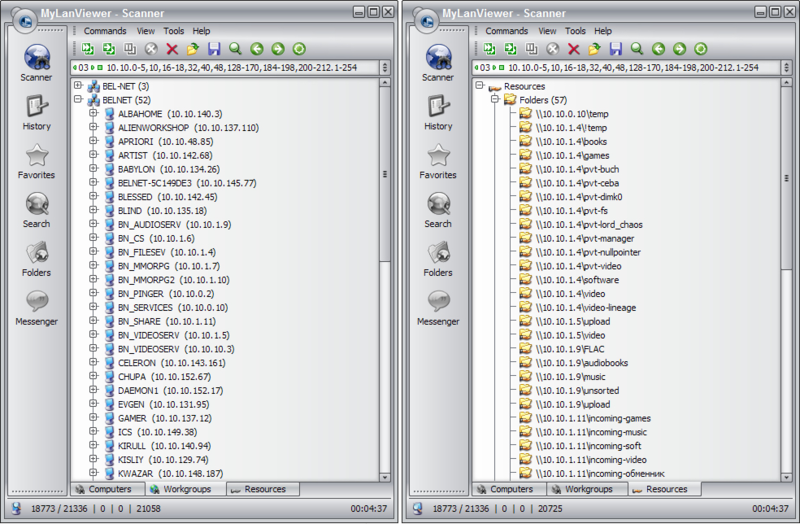 And as far as omniscience goes, you'll love MyLanViewer's ability to show you all of the workstations on your network, complete with details that include each machine's name, its IP address, MAC address, shared resources, and other technical details that network admins just love. Got pesky neighbors leeching off of your wifi? Not any more. MyLanViewer allows you to see all devices connected to your wifi router and detect unauthorized neighbor connections! How many calories have you wasted having to physically walk to computers on your network just to log them off, reboot them, or shut them down? Now you can stay settled in your big comfy office chair while you use MyLanViewer to do your bidding for you, remotely! See all devices connected to your wifi router and detect unauthorized neighbor connections. 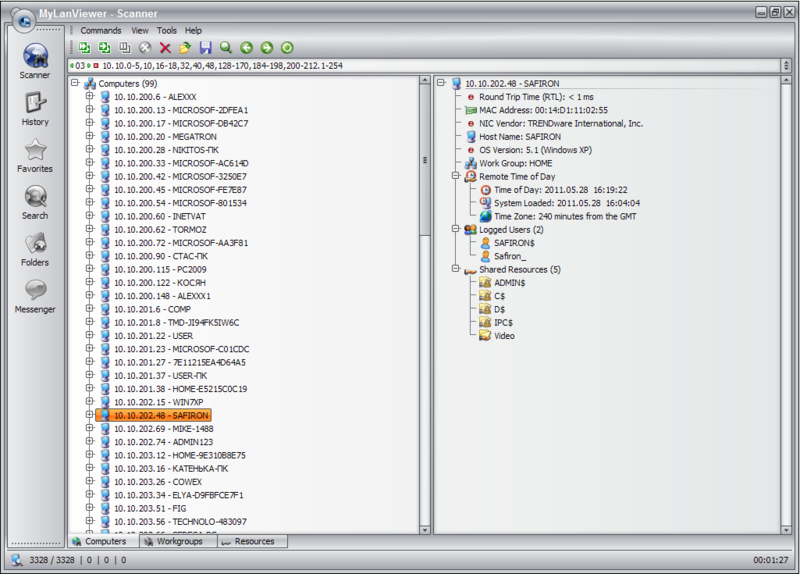 At a glance, see all of the important technical details of every workstation on your network. Remotely log off, reboot, shut down, and hibernate any workstation. Send messages to all users on your LAN. 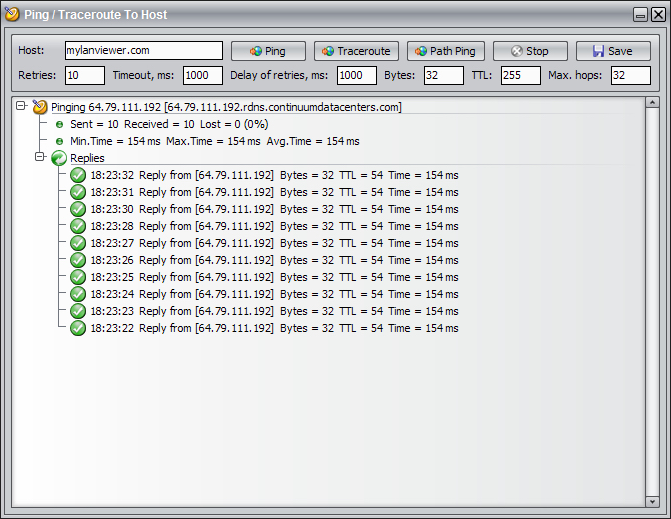 Run Whois and Traceroute tools. Manage your LAN effectively and better than ever before. After you purchase MyLanViewer it may be used indefinitely. MyLanViewer is licensed per computer, and not per user. SFuji Can this program be run from a flashdrive. 1. Where is the dwld link for the Portable version? 2. I searched but couldn't find the changelog page. Can you post the link, please? 3. What would be the discount if we want to buy now ? Sergey Korobov Yes, it can be run from a flash drive. You can move the folder "C:\Program Files (x86)\MyLanViewer" to a flash drive. "Make sure to input the registration info exactly as it is shown below". However, there is no such registration info. I even got a re-mailing of this "Software Receipt Mail" — but alas: Exactly the same result - NO licensing info was included ! Mike James Borge, in the email I received the registration info is in the yellow box at the bottom of the Registration Information section. Roman Yel'nikov How many time necessary waiting Reg. Code to e-mail. I am already wait about 30 min. Tortuga @Sergey Korobov :) Thank you for your answer abt the portable version. Constantin Florea @Borge Larsen - There was indeed an issue with this promotion which could have caused the registration code to be blank in the receipt email. I have just resent you the receipt email and it should now have the correct code in it. Constantin Florea @Roman Yel'nikov - I have just resent you the receipt email. You must install/register the software within 7 days, and cannot do so afterwards. Upgrades to future versions of the software will require additional payment. Installing a new version may overwrite the existing version and invalidate your free license key. Use this registration information to unlock the software after installation. " There are, as you wrote, two yellow (or orange) fields - and both of these fields are included in the above copy - but neither of them include any licensing data. Can anyone from BdJ help in this matter . . . ? Sorry - hadn't seen your post above. I just now checked my mailbox and found your mail with the license code. So everything is OK now. ZAW HAN Thank you for this deal. I just installed it but my laptop is going to repair shop next week. If they reinstall OS, can I still install it again? Trucker Why do I get an error code 174 on the old version of this program ? It say that I need to install a newer version, why ? Dana Anderson It won't take my registration code. No mention of registration name is made in the email, except Purchased by:, but it is not accepting my input. I tried leaving the name blank, that didn't work. I tried putting in MyLanViewer as the name, that didn't work. It gives no error message, it just sits there not doing anything. 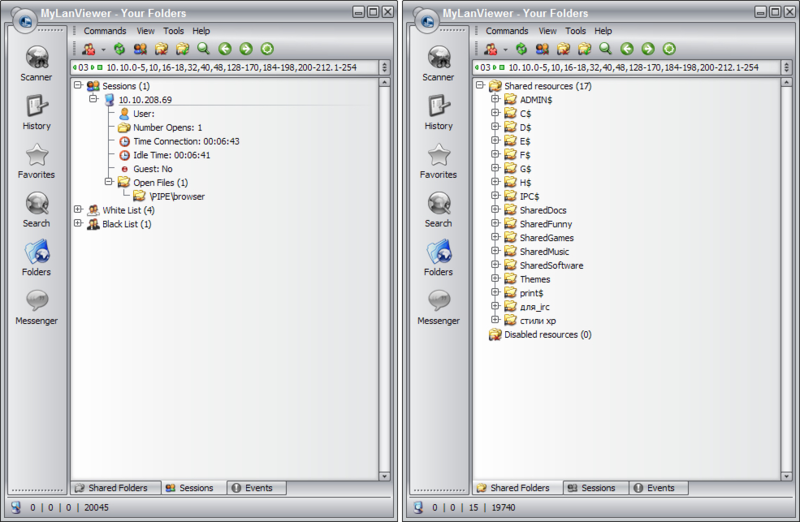 SO, I just looked in the registry file and there was still a lot of info from the old version that haven't been removed when I uninstalled that old version. Dana Anderson That's not my problem. I upgraded to Windows 7 Pro and had to wait for this deal again to get it, since you have to install it within 7 days. The registry wouldn't have this yet. it installed, it just won't take the code. mactricks Don't leave running in background - crashes (Win 7). Trucker @Sergey Korobov - Your program have some serious issues, maybe it would be a good idea to beta test it, before giving it away for free. Transfer to another computer is allowed. Must install within 7 days / cannot after. Greg Newell Hey Trucker! YOU are the beta test! LOL. S. Imrick Not for W8? boo! The download on C|NET says it is, and that's version 4.16.1 - what version is this? is this your website? http://www.sksoftware.com/ if it is, it's pretty sparse - nothing there but a telephone number. Chris Roy Jackson @S. Imrick... Per Info Above: http://www.mylanviewer.com/home.html is their Website HOME... on the following Page http://www.mylanviewer.co...anner.html You will find Specific information about this ONE Product (i.e. Current Version 4.17.4 and Supported OSs [Win 8 is included]) System requirements: Windows 2000, XP, 2003, Vista, 7, 2008, 8. 32-bit or 64-bit. Net Framework is not required. I hope that helps !! !